CULVER CITY, Calif. (September 8, 2016) – Vive les Frasers! Claire (Caitriona Balfe) and Jamie’s (Sam Heughan) epic time-traveling love story continues as the couple sets sail for France when OUTLANDER: SEASON TWO debuts on digital October 31and Blu-ray™ and DVD Nov. 1 from Sony Pictures Home Entertainment. 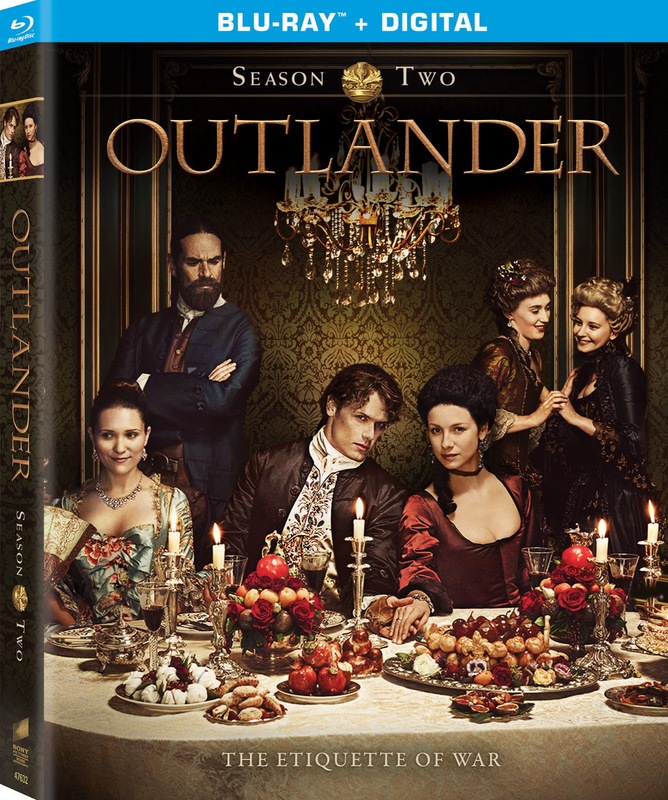 OUTLANDER: SEASON TWO takes Claire and Jamie out of the Scottish Highlands, dropping them into the royal Parisian courts of King Louis XV to try to infiltrate the Jacobite rebellion. Forget the past, it's time to rewrite history! 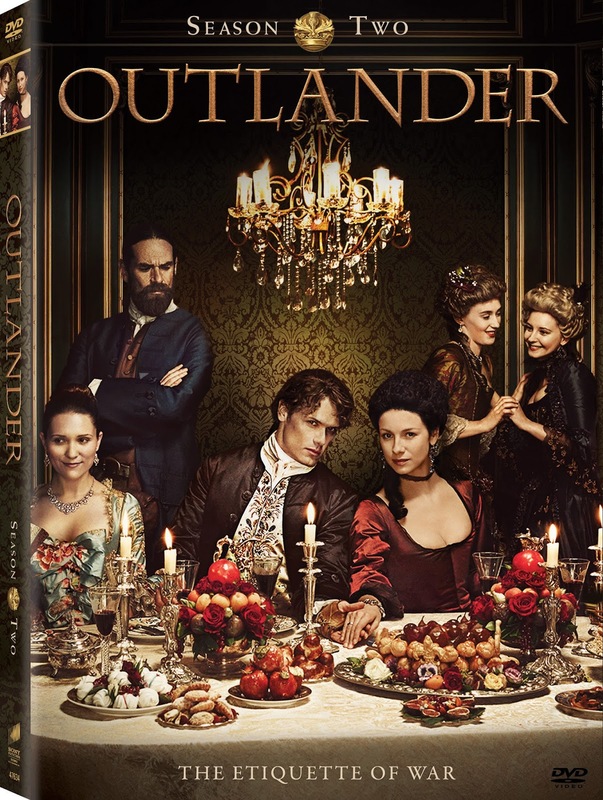 Based on Diana Gabaldon’s international best-selling book series about a British WWII nurse who is mysteriously swept back in time to Scotland in 1743, Outlander has become a pop culture phenomenon and captivated audiences with its breathtaking romance, science fiction, history and adventure. The hit Starz series also stars Tobias Menzies (TV’s “Game of Thrones”), Duncan Lacroix (TV’s “Vikings”), Graham McTavish (The Hobbit trilogy), Stephen Walters (TV’s “A.D. The Bible Continues”), and Grant O’Rourke (Crying with Laughter), and introduces series newcomers Rosie Day (All Roads Lead to Rome), Andrew Gower (TV’s “A.D. The Bible Continues”) and Stanley Weber (TV’s “Borgia”). Outlander was developed by executive producer Ronald D. Moore (TV’s “Battlestar Galactica”) and is produced by Tall Ship Productions, Story Mining & Supply Company, and Left Bank Pictures in association with Sony Pictures Television. 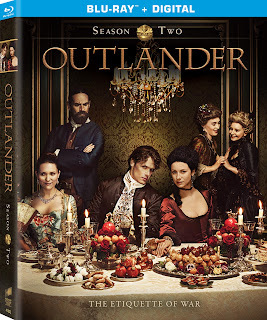 Blu-ray exclusive content includes an extended version of the episode “Faith,” with an additional 11 minutes of the heart-wrenching episode, an alternate scene from the episode “Dragonfly in Amber,” the Outlander podcasts for each episode with commentary from Ronald D. Moore, and three additional featurettes. “Jamie & Claire: To Hell and Back” looks into the highs and lows that Jamie and Claire have been through this season and how they survived based on their unconditional faith in one another, while “Designing History: The Costumes of Outlander” and “Recreating 18th Century Paris” showcase the intricate new costumes and set designs from Claire and Jamie’s time in France. Claire (Caitriona Balfe) and Jamie (Sam Heughan) arrive in France, hell‐bent on infiltrating the Jacobite rebellion led by Prince Charles Stuart (Andrew Gower) and stopping the battle of Culloden. With the help of Jamie’s cousin Jared (Robert Cavanah), they are thrown into the lavish world of French society, where intrigue and parties are abundant but political gain proves far less fruitful. Altering the course of history presents challenges that begin to weigh on the very fabric of their relationship – but, armed with the knowledge of what lies ahead, Claire and Jamie must race to prevent a doomed Highland uprising and the extinction of Scottish life as they know it. Broadcast Year: 2016 (Starz). OUTLANDER: SEASON 2 is not rated. Emmy® is the trademark property of ATAS/NATAS. Golden Globe® is the registered trademark of the HFPA. Sony Pictures Home Entertainment (SPHE) is a Sony Pictures Entertainment (SPE) company. Sony Pictures Entertainment (SPE) is a subsidiary of Sony Entertainment Inc., a subsidiary of Tokyo-based Sony Corporation. SPE’s global operations encompass motion picture production, acquisition and distribution; television production, acquisition and distribution; television networks; digital content creation and distribution; operation of studio facilities; and development of new entertainment products, services and technologies. For additional information, go tohttp://www.sonypictures.com.